Snow Owl allows creating and modifying ATC codes. Validation support during the editing process ensures that newly created codes conform with the ATC guidelines. To create a new ATC code, go to the ATC navigator, right click the parent, and select Add new child concept. This will open the new code in the editor. 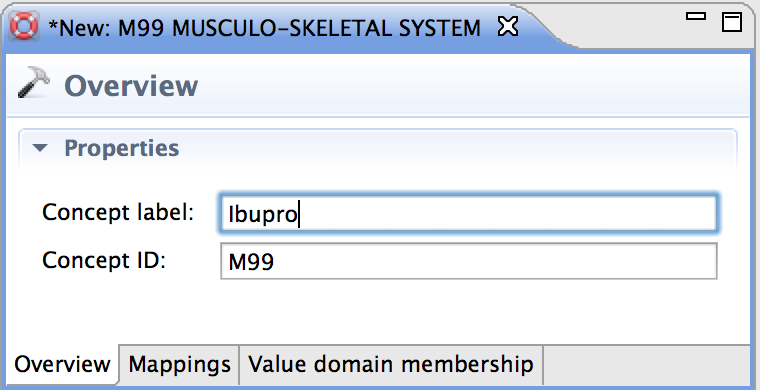 Concept label: By default, the label of the parent is used for the new code. To change the label, simply type in the text field. Concept ID: A new ATC code ID is automatically generated, which can be saved. If you want to change the code ID, make sure that they are consistent with the coding system. Once you are done editing, save your changes. The new ATC code is now visible in the ATC navigator and can also be found in searches. 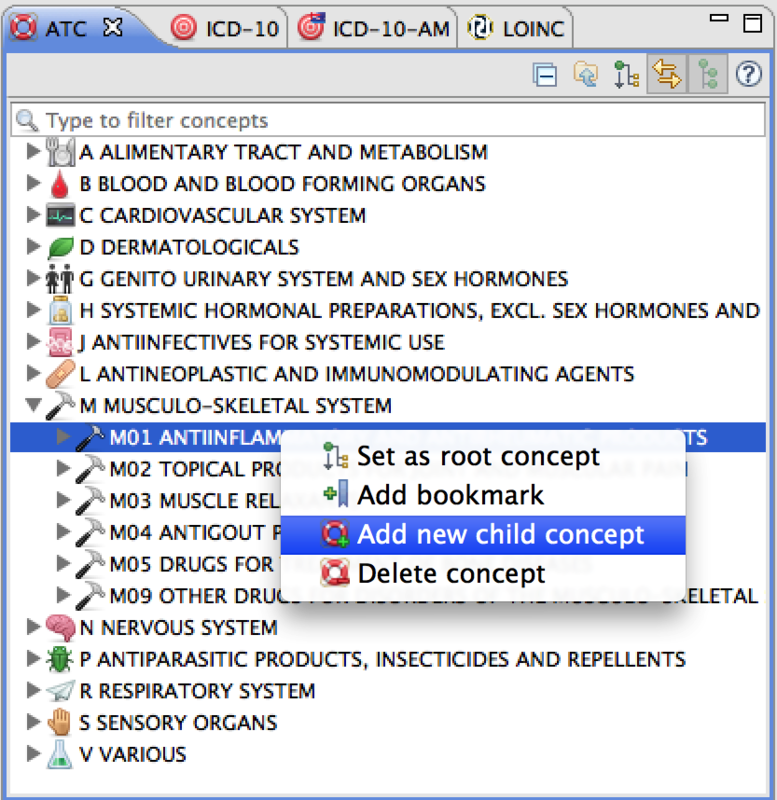 Note: Please keep in mind that the ATC Classification system consists of codes and not of concepts such as SNOMED CT. An ATC code is comprised of a code ID and a code label. To keep the original structure of ATC, it's not possible to add top-level codes. The code validation prevents you from authoring invalid codes, because errors have to be fixed before saving. An error message in the editor will inform you about the kind of problem. For example, if you make a change to the code ID that is not consistent with the coding format or if the change points to a different parent than it was created for. Click on the link to go to the respective text field. Open the code in the editor. Enter modifications in the text field. You can delete, overwrite or add text for the code label. The ID of existing codes can not be edited. Save and enter a comment to commit the modifications. The modified code is now displayed in the ATC view. 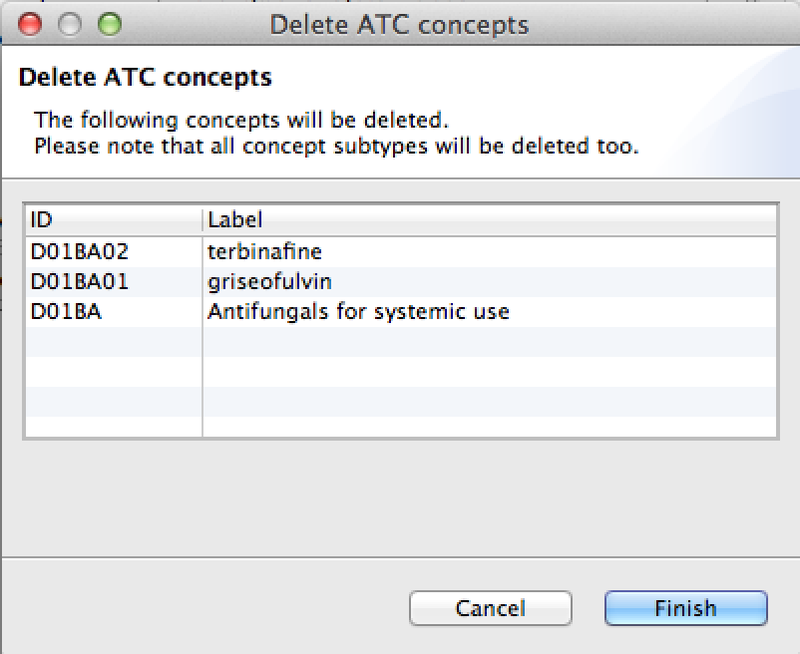 You can delete an ATC code by right-clicking the code in the ATC navigator and selecting Delete concept. When deleting a code all subtypes will also be deleted. To avoid mistakes, you will be presented with a deletion plan. Click Finish to confirm the deletion, or Cancel to keep the code. The deleted code will be no longer displayed in the ATC view.